The UAE has launched a regional space collaboration programme that aims to empower the Arab world in the global space industry. The ‘Arab Space Cooperation Group’ includes partnership between the UAE and 10 other Arab countries, including Saudi Arabia, Bahrain, Oman, Egypt, Algeria, Morocco, Jordan, Lebanon, Sudan and Kuwait. The programme will involve exchange of knowledge and working on joint projects, ultimately boosting the Arab space industry. His Highness Sheikh Mohammed bin Rashid Al Maktoum, Vice-President and Prime Minister of the UAE and Ruler of Dubai, launched the group during the inaugural day of the Global Space Congress, which is being held in Abu Dhabi until March 21. Representatives from the 10 countries joined Sheikh Mohammed on stage for a group photo. 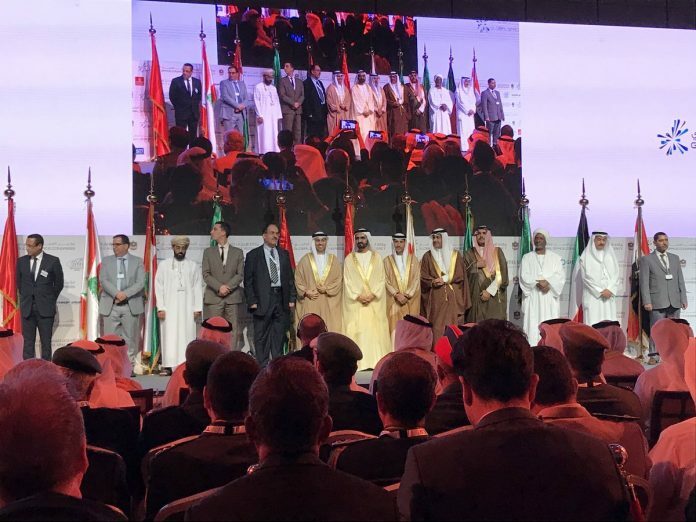 “During the opening of the Global Space Congress in Abu Dhabi, we attended the launch of the first Arab space coordination group that includes 11 countries. The group’s first project will be a satellite built by Arab scientists in the UAE. I personally believe in Arab talents,” Sheikh Mohammed tweeted. The satellite will be called ‘813’ and has been given that name to highlight an important year in the Arab history. “We called the new satellite “813” in reference to the date that marked the beginning of prosperity for the House of Wisdom in Baghdad under the reign of Al Ma’mun. Resembling our region, the House embraced scientists, translated notable texts and produced scientific capabilities,” Sheikh Mohammed said in a tweet. The satellite will be built by engineers and scientists from all 11 countries in the group. It will aim to tackle climate and environmental issues in the Arab world and other parts of the globe, according to Dr Mohammed Al Ahbabi, director-general of the UAE Space Agency. Meanwhile, Dr. Valanathan Munsami, the CEO of the South African Space Agency (SANSA) and the former Chair of the African Space Policy working group has emphasized this is a direction Africa also need to follow in a tweet. While Egypt, Morocco, Sudan and Algeria are prominent members of the African Space Program, they are also part of the Arab Member states. Egypt was also recently endorsed as the host of the African Space Agency at the just concluded 32nd Ordinary Session of the Assembly of the African Union which held at the African Union Headquarter in Addis Ababa, Ethiopia.